White water rafting, otherwise known as ‘river-rafting’ has been considered Swaziland’s #1 adventure activity for over 25 years. Trips depart on a daily basis throughout the year, with various formats such as Half-day White Water Rafting, Full-day White water Rafting and a Rafting-Abseiling-Tubing Combos. Swazi Trails is the sole operator of this adventure activity in Swaziland. The same pioneering team responsible for its launch in 1991, is still at the helm to ensure safe and fun excursions. Raft trips are run on on both of Swaziland’s largest rivers. Our route on the Great Usutu River is roughly between the towns of Sidvokodvo and Siphofaneni in central Swaziland. On the Komati River we raft downstream of Maguga Dam, which is considered northern Swaziland. There are seasonal variations in terms of the distance covered and rapids run, but regardless of the time of year, we always have fun! Our white water rafting departure point in the Ezulwini Valley is roughly halfway between the two rivers, giving us the flexibility to go wherever the river conditions are best on a daily basis. White water rafting trips in Swaziland are run predominantly in two-man inflatable rafts, although for high-water conditions we do have the option to use 8-man inflatable rafts. Trained river guides accompany all trips. Departures are guaranteed for a low minimum of only 2 persons. Note: seasons may vary due to changing river conditions from year to year. Seek clarification on trips available at the time of booking. Our daily logistics are subject to change at short notice as we we seek out the best conditions available. 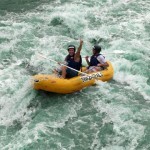 Our Swazi Trails Flickr page – regular images from daily white water rafting excursions are posted here. Pick an album from the month of the year in which you will be visiting to get an idea of expected river conditions. At last count we had over 89,000 images online – so there is no shortage of material to look through. We hope to see your happy face here one day too!